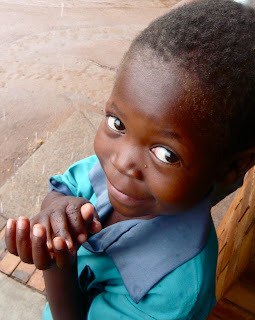 You may remember last year I wrote a post about 'Introducing charity to your children' - it opened up a lot of important discussions and inspired a few of you to write your own posts about the subject *proud face*. Christmas is coming, did you notice? It was made official to me when I heard the magic words that fill me with joy and make me feel like a ten year old little girl all over again "holidays are coming... holidays are coming" - yep the Coca Cola advert, smack bang in the middle of the Xfactor ads last week. Christmas is officially here! If you read my aforementioned post you'll know that we decided to use this magical time to try and teach Belle the importance of giving to others less fortunate every year, so she will learn to be grateful for everything she has. We sacrifice a stocking filler gift that we would normally buy her - you know, that millionth Peppa Pig DVD, and instead make a donation to a charity for the same value as the gift would have been. We then write a note about how proud we are of her for giving up a gift to help others and put it into her stocking. She’s still so young, but this will be a tradition in our house, and we will keep the cards to show her as she grows. A small gesture, but one that not only raises much needed funds for a charity, it also helps us teach our little girl the importance of giving. Well, this year I have had the amazing pleasure of working as a freelance marketing manager for the inspirational African Children's Choir. Yep, the beautiful children who performed with Mr Gary Barlow (swoon) at this year's Diamond Jubilee celebrations. 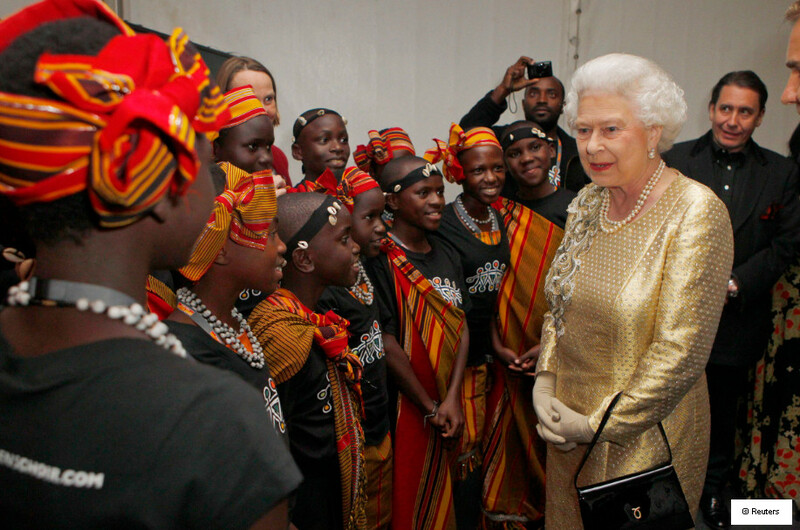 When discussing Christmas fundraising ideas I told the team about what we do for Belle, and so the campaign Give up a Gift for Africa was born. You too can teach your child the importance of giving this Christmas whilst also supporting and raising funds for this inspirational charity. The African Children's Choir perform around the world, acting as the ambassadors for Africa's most in need children - raising much needed awareness and funds for the education of the continent’s most vulnerable children, as well as their own education, as they go. 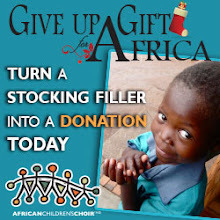 Give up a Gift for Africa is appealing to parents, like you, to turn one of your child’s stocking filler gifts into a donation to The African Children’s Choir this Christmas – as we will be doing with Belle. Once the donation has been made you will receive a link to a printable Christmas card, via your confirmation email, to put into your child’s stocking as a thank you – there’s even space to write them a special message. 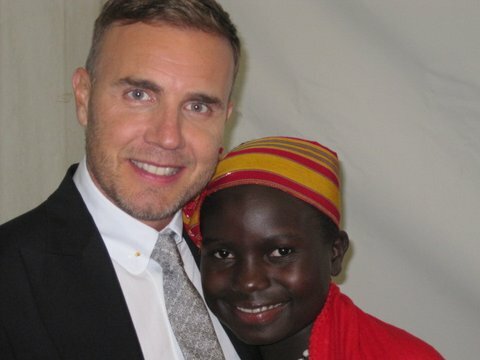 Money raised by the Give up a Gift for Africa campaign will go towards both The African Children’s Choir programme, and the many other essential programmes run by their official fundraising charity Music for Life, who have helped educate over 52,000 vulnerable African children in their 28 years. 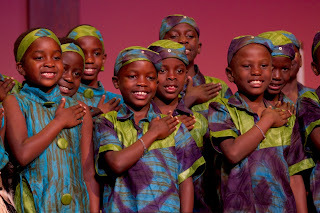 So you too can teach your children the important message of giving this Christmas by donating to The African Children’s Choir on behalf of your child, helping us create ChangeMakers for the future of Africa. I can't tell you how much it would mean to me personally if you could donate and help support. I know that with your help, we can really make a difference to the lives of the most vulnerable African children, whilst also teaching our own children the importance of giving this Christmas.